Together with the calming supplements, cat calming sprays are also introduced to the market of pet owners as an addition to the family of pet calming remedies. Most of these sprays are formulated using pheromone analogues that help them stay calm during stressful events. 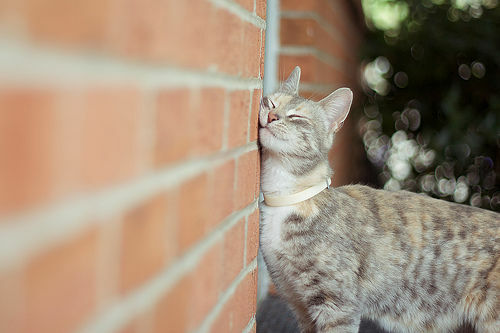 Pheromones are cat’s natural hormones excreted outside the body, which they use to mark their territories as safe. It is their innate response to rub their cheeks to areas where they feel secure. As they pass through the areas with existing feline facial pheromones, their endocrine system reacts to it which immediately produce a calming effect on their mind and body. In the absence of pheromones, cats become vulnerable to stress, depression, and anxiety, which is evident through their sprayed markings, clawing and relentless scratching. When this happens, the cats are not the only one being stressed, but also their humans. In order to make both lives easier, cat calming sprays containing artificial pheromones have been produced to help release your cat’s tension during a tough situation. Using cat calming spray has several advantages over orally administered relaxants or calming medications. Unlike orally administered drugs and dietary supplements which are harder to give to pets, especially when they have reduced appetite, calming sprays work wonders on your cat just by applying it on their beddings and crates. The calming spray formulas are also available in diffuser forms, which makes it a lot easier to spread the pheromone into the room. Calming sprays come in small, handy containers that can fit your purse. You can bring it anywhere along with your pet and use it whenever you need to. It won’t eat up more space unlike other cat calming supplements in big, heavy pouches. Although calming sprays and diffusers have the same function which is to mimic pheromones in the environment, it is presumed that sprays work better as it is directly applied to the spots where your cat is mostly associated with. In this manner, your pet can instantly pick up the signal, making them feel more relaxed and at ease in no time. Because cat calming sprays are only applied to a cat’s external environment, the risk of having medical complications is rarely possible. They only exhibit their natural response to pheromone analogues and no other harmful chemicals are being induced to suppress their mental activity. Calming sprays for cats have become an essential tool for people like us who want to relieve their pets from sudden stress and nervousness. If this is your first time hearing about cat calming sprays, then it would benefit you to know about the best cat calming sprays which you could buy from Amazon. Here are the Top 4 Cat Calming Spray brands that you can use to free your cat from stress-related behaviors. One of the well-known cat calming sprays is the Comfort Zone brand. It has been tagged as the No.1 Brand in Cat and Dog Behavior Management. They have products ranging from cat sprays and diffusers that release a natural, odorless vapor similar to cat pheromones which functions as a safety indicator. The presence of pheromones in their environment keeps them calm and reduces their anxious behaviors such as clawing and urine spraying. Comfort Zone Pheromone Sprays comes in handy when you have to take your pet on a short trip. By simply spraying on beddings or carriers, your cat will feel at ease and secure all throughout the travel time. Unlike other brands, Comfort Zone products are guaranteed to show positive results within one week of use, thus it is highly recommended by the veterinarians all over the world. Reduce urine marking and scratching,Clinically proven 90% effective. Cat calming spray list is not complete without Thunder Ease Cat Calming Spray. It was produced by Thunderworks, the makers of the famous Thundershirt that specializes in pet calming products. Thunder Ease Calming Spray for Cats work by using a natural analogue of cat’s facial pheromones which is easily detected by your feline friend and adapts to it in an instant. It helps stabilize the cat’s uneasy behavior while gradually reducing their stress in just 15 minutes after application. If you’re looking for affordable yet safe and effective relaxing spray for your furry baby, then the Thunder Ease Cat Calming Spray could be the one you’re looking for. Another effective cat calming spray which you can find on Amazon is the Sentry Calming Pheromone Spray for Cats. Its fragrance is derived from Lavender and chamomile extracts. These two herbs are well-known for their soothing aroma that promotes relaxation of mind and body by slowing down the central nervous system activity. It also helps alleviate spasms, stress-related behaviors, anxiety and lack of sleep. In addition to the relaxing scent, it also resembles the cat’s natural pheromones thus your pet feels more comfortable once it’s sprayed on to their surroundings. The Quick and Easy Way to Calm Your Cat with GoodBehavior pheromone technology. To wrap up our list of best cat calming sprays for cats, here’s the Ceva Feliway Pheromone Travel Spray that provides ultimate comfort and calmness to cats of all ages – from kittens to senior feline groups. Feliway has been known to halt destructive behavior among cats who are undergoing stress and anxiety. It maintains your cat’s normal behavior while reducing their urge to scratch and mark places in your home. Unlike administered drugs that have permanent psychologic effects on cats, Ceva Feliway is non-toxic and proven to have no side effects on both humans and animals. It is a colorless spray with powerful pheromone analogue that is easily perceived by cats. You’ll have to keep this handy if you prefer odorless cat calming spray that is safe for daily use. Convenient Spray Bottle, Reduces the stress of a new environment, loud noises, Calms your pet to stop scratching, biting and urine making. How well a cat calming spray works depends on different factors. Although pheromones are instantly recognized by cats, an absolute reversal of their unwanted behavior derived from more serious stressors like separation anxiety and home relocation might take longer than expected. Your cat can show significant change within two weeks but in some cases, it could take a few months before their anxiety and depression are totally improved. Considering this, choose a cat calming spray that is intended for long-term use. Always root for brands that utilize natural extracts and non-chemical formula, so you won’t have to worry about any repercussions. Overall, cat calming sprays may not be a total cure but still, it is a good alternative to sedative drugs and oral medications. If you find this article helpful, please don’t hesitate to share us your insights and let us know how cat calming sprays have helped you win your beloved cat over anxiety, stress, and depression.